When Ford put together the 2011 to 2014 Mustangs, they gave them some impressive power, but they didn't give it an aggressive sound to match. Fortunately, we have you covered when it comes to achieving the sound that's right for you. From a raspy race car sound to a deep and throaty muscle car growl, we have you covered with the top manufacturers to instantly transform your 5.0L V8 into a Mustang you can be proud of. To take your Mustang GT to the next level and get serious about dusting the competition at the track, consider a full-on exhaust system overhaul from our friends at Stainless Works. Below is a video of the "before and after" of a full Stainless Works Performance Cat-Back Exhaust System paired up with Stainless Works Long Tube Headers and X-Pipe on a Mustang GT. You can hear how it really transformed the stock Mustang GT, giving it a throaty and mean muscle car sound. While the factory exhaust systems on the 2011 to 2014 Mustangs are probably some of the best that Ford's Pony Car has had in a while, the still sound fairly weak for the sheer amount of power that their engine's are capable of spitting out. The good news it that the aftermarket saw that little problem from a mile away, and there are a ton of solutions for getting a bigger sound and some extra horsepower out of your Mustang, whether it's rocking a big Coyote V8 or the nimble Duratec V6. 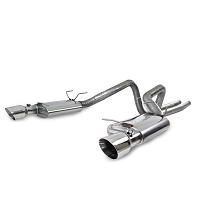 2011-2014 Mustang Exhaust upgrades are always a great option for performance and sound, but with so many options, it all can get pretty confusing. How is my Mustang's exhaust set up? Unlike the SN95 Mustangs, all of the Mustangs from 2005 to 2014 have a rear-muffler setup. 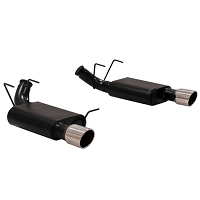 Your Mustang's exhaust gasses exit its cylinders into its exhaust manifolds, which then travel through its H-pipe and catalytic converters, through the kickover tubes (or over-axle tubes), through your mufflers, and out the exhaust tips at the rear of your Mustang. How do I get a better exhaust note? Go out and find a 1969 Mach 1 428 Super Cobra Jet. Purchase it. Bathe in its glory. If that's too much of a hassle for you, then your best option (and often the first performance part that many customers purchase) is an axle-back exhaust kit. 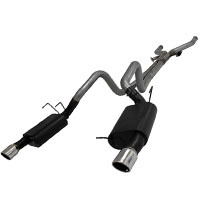 Mustang Axle-back exhaust systems replace your exhaust tips, mufflers, and inlet tubing with something a bit more aggressive. How aggressive ranges from "is the car running?" to "my ears are bleeding." Axle-backs have almost limitless design possibilities with variations in tip diameter, muffler design, muffler packing, construction material, and any combination thereof. While a Mustang axle-back will get you some better sound, you probably won't be seeing much, if any, power out of it. Anyone who says otherwise is a liar and horse thief. 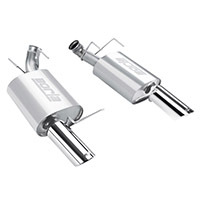 A cat-back exhaust kit will get you some slight gains by swapping out your over-axle tubes, mufflers, and tips for more efficient tubing. 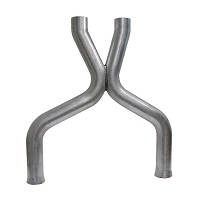 Real gains start at the mid-pipe where your restrictive factory catalytic converters choke off a good bit of exhaust flow. 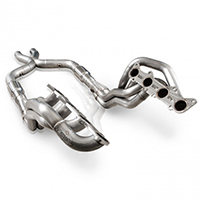 Aftermarket mid-pipes feature either high-flow cats or full cat deletes that can get you up to 15 to 20 horsepower with the right PCM tuning. 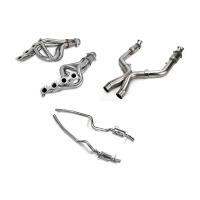 For even bigger gains, you need long tube headers, or one of our headers and mid-pipe combo kits. 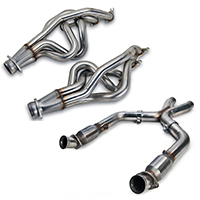 These systems can see horsepower rise by as much as 30hp, though any aftermarket mid-pipe system may not be street-legal in your area. What's the most powerful street-legal setup? 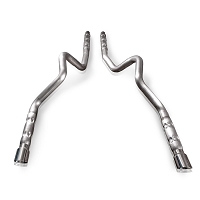 To keep your Mustang 50-state street legal while still getting you some gains, we recommend sticking with your factory manifolds, throwing in clamp-on or cut-in X-pipe, and grabbing a full Mustang 2011-2014 cat-back exhaust.